With the new sink, we would gain an inch in depth — very noticeable! 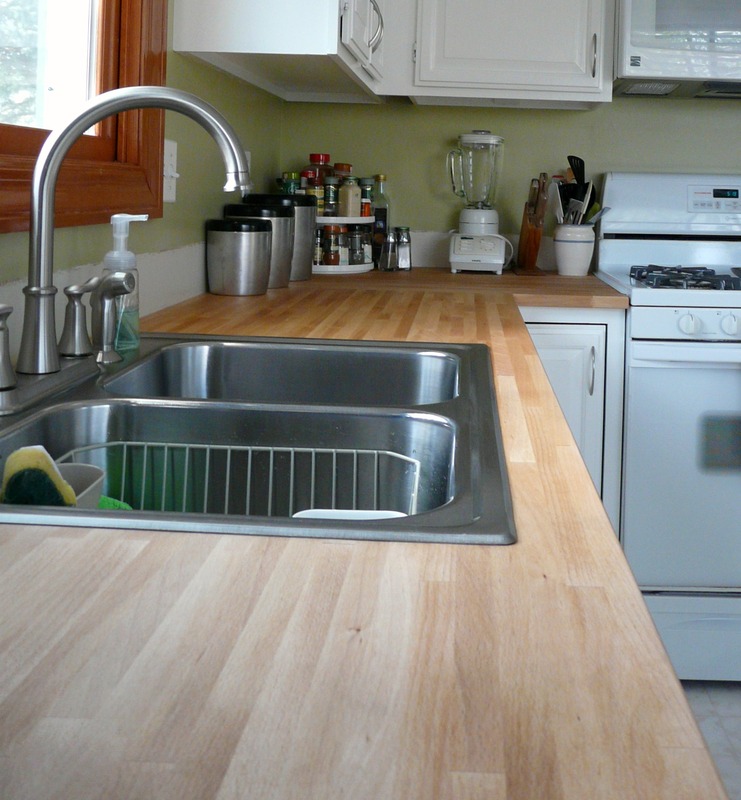 And with the new faucet, we would gain MUCH more space under the spout for tall items — cookie sheets, for instance :). It’s a work in progress! So far, I’ve used a homemade beeswax-and-mineral-oil paste to rub into the wood. I tried mineral oil alone first, but it kept raising the grain of the wood. Here’s a good “recipe.” Also, in these pics you see the wall where the old molded backsplash, attached to the old counter, came up the wall. I’ll soon paint it the same color as the wall until I decide what to do for a new backsplash. For the window, I finally tried an idea I’ve had tucked away in my mind. I bought a vinyl roller blind (at Menard’s, where they cut it to size) and hung it up. I bought and cut fabric to fit the window with 1″ extra on each side for a fused hem, 1-1/4″ extra at the bottom for a rod pocket, and about 6-8″ extra at the top, to go around the roller. I took down the blind, unrolled it on a clean table, left a couple revolutions of the vinyl on the roller and cut the rest off. I then overlapped the top edge of the fabric with the bottom of the vinyl left on the roller and taped it with packaging tape, both front and back. I stuck the rod in the rod pocket. I rolled the blind up tightly, now with the fabric on it, and hung it back up. It works great! (The clear plastic handle I put on the bottom of the blind to protect it from wet hands, etc., is too tight and makes the rod curl in these photos. I need to take it off, I think.) On the left, under the window, are narrow shelves for cookbooks and other sundry items. These are made out of the leftover butcher block from the counters. They’re still unfinished, but I will likely stain and seal them eventually. 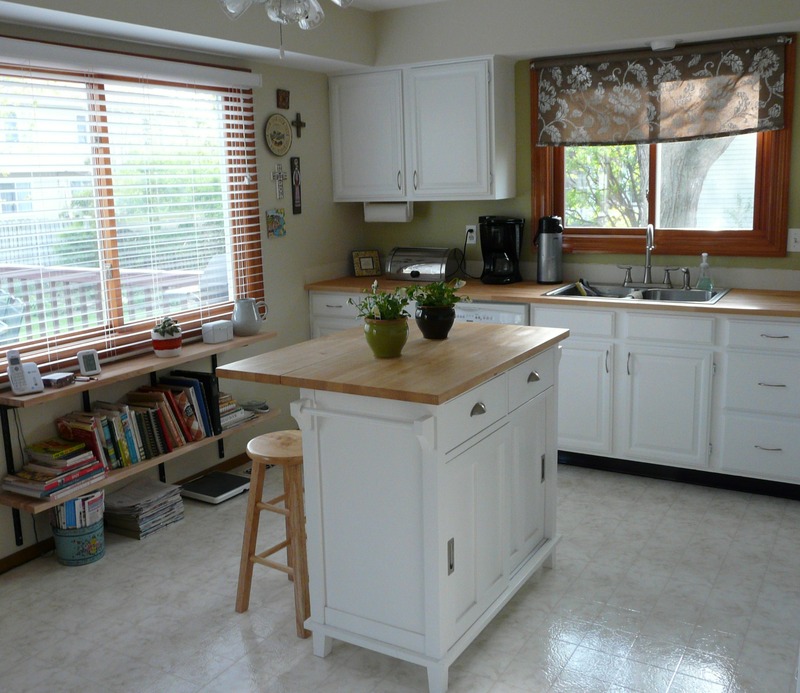 There’s an awful lot of white here with the cabinets, the appliances, the island, the floor. Again, this kitchen is a work in progress! I’m painting the island right now (“Mega Greige” by Sherwin-Williams). Hope to change out the floor with my hubby sometime this year when we’re both free for a big project. And then we’ll reconsider lighting above the island, where there’s currently a fan with down-lights. I’m so happy with it! I love the sense of lightness from the white and the warmth and organic feel of the wood, just as I had hoped :). Amazing! We have a lot in common. I stumbled across your website because you make the same type of blankets I do. I don’t sell mine .I make them as gifts. I so love making these blankets and I love yours! Interestingly, your kitchen looks almost identical to mine, green wall paint, white appliances. cabinets and all. I added a stainless steel backsplash behind my stove and my countertops are a grey and black corian. I have a white tile floor that will eventually be replaced with hard wood. I am a healthcare professional as well. I think we are kindred spirits! Oh my goodness, we DO have a lot in common. Can we meet for coffee and exchanging ideas?? I’d love to see your blankets, as I completely understand how much pure joy that brings. And I’m making little bits of kitchen progress: bought a hanging light at Habitat for Humanity’s local ReStore for over the sink, painted the island “greige,” painted the darker green wall the same color as the part above the cabinets, and bought some laminate flooring which is waiting for a open weekend to be installed :). Your kitchen looks great! The power of paint & hard work is amazing. I think the island will look great painted Mega Greige. It is a great color, I used it in our hall bath. Enjoy your new kitchen! Amazing!!! This is what I’m hoping to do to my kitchen this summer. It looks really great! Thanks, northofseven. There’s still work to be done, but it’ll wait for fall. I picked up some laminate flooring on sale at Costco. I’m trolling Craigslist for some bar stools I like better. Tinking aout what art I might like on the wall where the little ceramic collection is. I don’t mind doing it piece by piece. Lovely transformation!! Where do get your butcher block? We bought ours from Ikea…and this is funny…I was intensely reading your method of applying fabric to your roller shades, when I saw the picture…not only did we buy the same kits for the cabinet transformation (I did the 3rd step of antiquing mine)…but we also have the same fabric (from Hobby Lobby??) except I used mine on the back of my new Ikea cabinets. Very creative! Wow!!! It looks so fresh and clean and cheery. Do I have to wait until my children are in college or married to take on such a massive job? It’s brown MDF doors for me til then. What an inspiration. No, silly :). You just have to be willing to live in a bit of kitchen chaos for a week or two. Give me a call — I would love to help. Summer’s perfect because you can cook and eat outside!